I’ve created a simple GUI frontend for Deskew. Now it’s easier to process many files without writing shell scripts. It needs the command line tool which is called for the each input file. 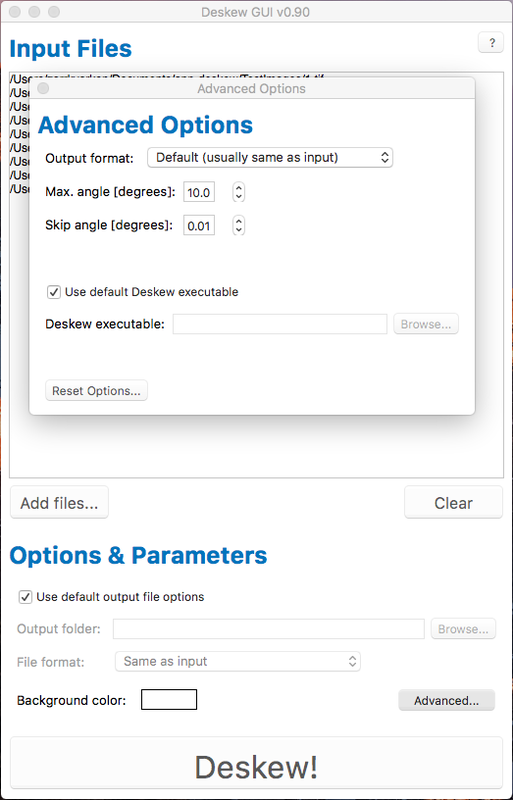 You can set the basic and most of the advanced options for deskewing in the GUI. Prebuilt executables for Windows and Linux are available in the download – you just place them to the same folder as the command line tool. Version for macOS is a bit more convenient – it’s a self-contained app bundle with CLI tool already inside and all placed in DMG image. You can also set the explicit path to the command line tool in the program itself. The GUI is written in Lazarus so it may not be a best native-looking application out there but it saved me some time – there wouldn’t be any GUI if it would be a big time sink. GUI frontend for Deskew command line tool. Prebuilt binaries for Windows, macOS, and Linux. Windows and Linux versions need Deskew command line tool binaries. Command line tool for deskewing scanned documents. Binaries for several platforms, test images, and Object Pascal source code included. GUI is in the same repository as the command line tool, you can find the links here Deskew Tools. 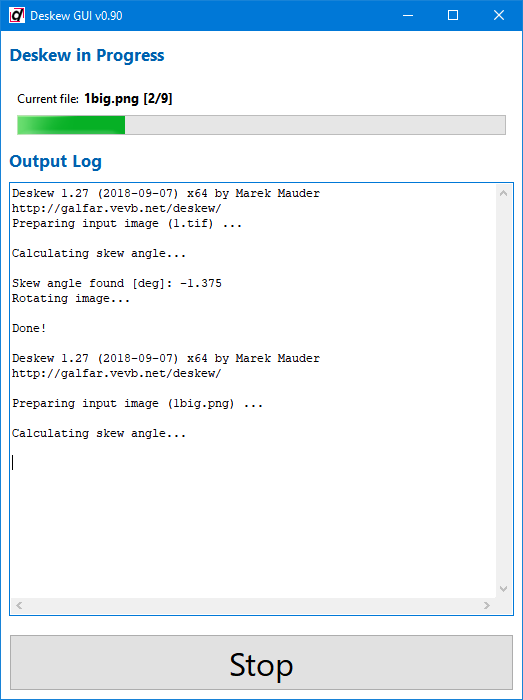 A few years ago I wrote about my Problems with CDB Debugger in QtCreator. And a few months ago debugging started getting slower and slower and it finally reached a point where the program would need a minute or more just to start and stopping for a breakpoint was almost a coffee break situation. The old remedy wasn’t helping anymore — this was something new. While searching for a cure I stumbled upon Qt mailing list thread where the culprit was identified. It’s Microsoft’s symbol server! Just go to Options -> Debugger -> CDB Paths tab and make sure srv* path is below cache* (or just remove it altogether). Looks like server symbols are preferred over local symbol cache if on top and that server is now terribly slow. 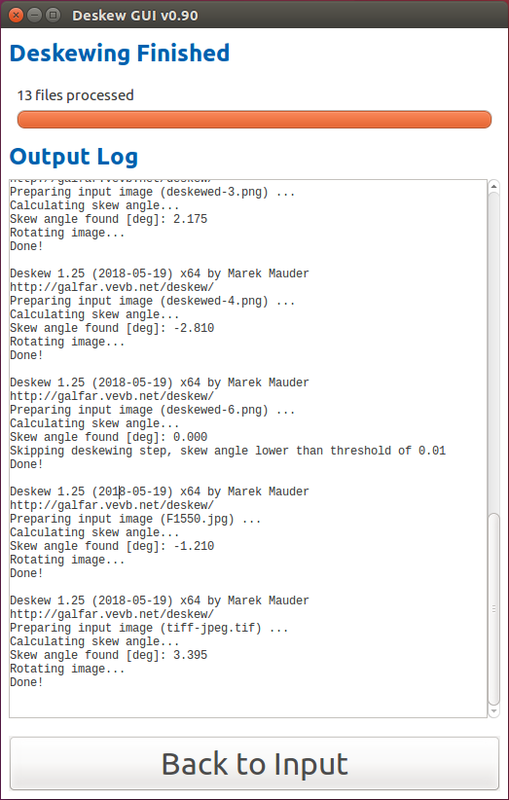 New version of Deskew command line tool is ready. You can find general info about Deskew here Deskew Tools. GeoTrans (Geographic Translator) is a software that allows you to convert geographic coordinates among a variety of coordinate systems, map projections, and datums. It is made available by U.S. National Geospatial Intelligence Agency at no cost and free of copyright restrictions. Some time ago Locals and Expressions view in QtCreator just stopped working for me. No locals were listed when the program stopped on a breakpoint, watches did not show the values, hovering with the mouse over a variable in the editor did not show its value in a tooltip. No fiddling with IDE options helped. This was on Windows using compiler from Visual C++ and CDB as a debugger. It was quite annoying but I was mostly working on UI at that time and could live with occasional dumping of few variables into a log. Few weeks later I moved to some math heavy stuff and the situation became desperate — I had to fix this! At first, I suspected the debugger or the compiler. Since reinstalling and trying different versions did not help I also tried different versions of Qt and QtCreator itself. Still broken. And Googling for broken CDB only revealed problems with CDB getting unusably slow. After QtCreator reinstall, I noticed the settings were preserved from the old version. So maybe they are somehow corrupted? I found them in C:\Users\username\AppData\Roaming\QtProject\qtcreator\, made a backup of that folder, and deleted it. And it started working! Locals and Expressions were back! Of course, I also wanted my old settings back. So I switched back to the old settings and started QtCreator again and to my surprise it still worked! I took a closer look and saw that the problem lies in the session file (*.qws) — when I previously deleted the settings folder QtCreator created a new session for me and this one I reopened in the IDE after the switch back to the old settings (just copied the files into the folder so the new session file stayed there). So I opened the session file with an intention to start deleting suspicious stuff until it works. It’s a XML file and apart from one big base64 blob there is not much else. Besides a breakpoint list, the only thing that seemed related to debugging was a list of maybe ten old watch expressions (which were not listed in the IDE anymore!). I deleted it and voilà, I could see the values of locals and variables again! After a few weeks, debugging started to get slow. Stepping over code took a few seconds and values of the variables showed up only after considerable time (tens of seconds). This time I knew what to do, deleting watch expressions from the session file helped again. So I came to the conclusion that in the first case the values could eventually show up after a few minutes (stepping over code was not slowed down though). It was just very very slow. Then the Googled complaints about slow CDB made more sense to me. And indeed, I found out someone fixed it the same way but I was not paying attention to just slow debugging before, I was looking for broken debugging! Debugging in QtCreator using CDB in Windows is very slow and/or values of locals and expressions never show up. 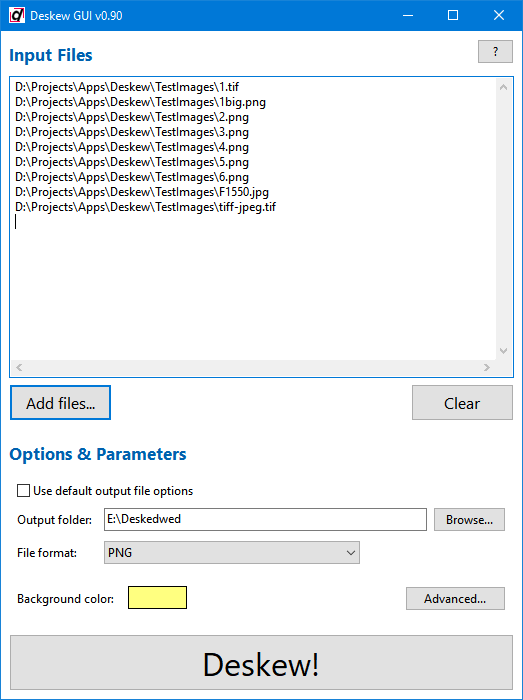 Go to the folder where QtCreator stores your session file (C:\Users\username\AppData\Roaming\QtProject\qtcreator\). Delete this subtree (or just the expressions) and save the file. Start QtCreator, open the fixed session, and do some debugging. Edit: If this doesn’t help check also Debugging with CDB in QtCreator Agonizingly Slow. Let’s assume we want to generate encryption key and initialization vector (IV) for AES encryption based on some passphrase. And we want to be able to generate the same key and IV for the same passphrase in .NET and Java – maybe we have Android app written in Java that needs to decrypt message from ASP.NET web app. We have the same key byte array, albeit with some more typing. And how about the initialization vector now? One could think that creating new PBEKeySpec with a length of 128 is the way to go. I know I did. Note: All the Java stuff was tested only with Android. There’s been a few requests for source code of Multilevel Geomipmapping terrain rendering. So I’m doing this now, finally. It has not been touched since 2008 but it compiles fine in current version of Lazarus. I tested it in Windows only but in 2008 it had run in Linux and FreeBSD as well. Unfortunately, not all the test terrain data could be included because of their massive size. You can find more info in included Readme and previously linked article. Note: release archive is in 7z format to get smaller download size. Terrain renderer using OpenGL. Includes Object Pascal source code, binaries, and test data. Put the entire heightmap into a texture. Have a small 2D grid (say 16×16 or 32×32) geometry ready for rendering terrain tiles. Build a quad tree over over the terrain. Root node covers entire terrain and each child then covers 1/4th of parent’s area. 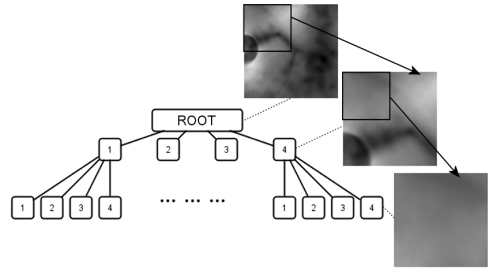 Traverse the quadtree starting from the root. YES it does, mark this node for rendering and end traversal of this subtree. NO it does not, continue traversal and test children of this node (unless we’re at leaf already). Now take this list of marked nodes and render them. The same 2D grid is used to render each tile: it’s scaled according to tile’s covered area and its vertices are displaced by height values read from texture. Root covers entire terrain, each child quarter of the parent’s area. This is basically what I originally wanted for Multilevel Geomipmapping years ago but couldn’t do in the end because of the state of VTF support on desktop at that time. So what exactly is the benefit of VTF over let’s say geomipmapping here? 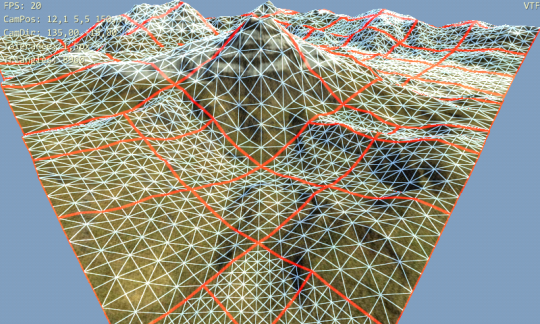 Main benefit is ability to get height of the terrain at any position (and multiple times) when processing each tile vertex. In traditional geomipmapping, even if you can move tile vertices around it’s no use since you have only one fixed height value available. With VTF, you can modify tile position of vertex as you like and still be able to get correct height value. This greatly simplifies tasks like connecting neighboring tiles with different levels of detail. No ugly skirts or special stitching stripes of geometry are needed as you can simply move edge points around in the vertex shader. Also geomorphing solutions begin to be usable without much work. And you can display larger terrains as well. With geomipmapping you always have to draw fixed number of tiles (visible leaves) — a number that goes up fast when you enlarge the terrain. 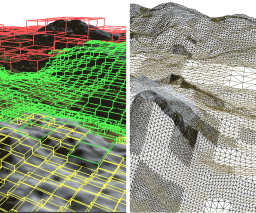 VTF may allow you draw fixed number of tiles — regardless of actual terrain size (as distant tiles cover much larger area compared to geomipmap tiles with fixed area). 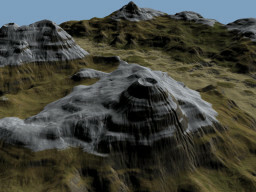 Another one, terrain normals can be calculated inside the shaders from neighboring height values. There must be some disadvantages, right? Sure, the support for VTF on mobile GLES 2 GPUs is scarce. So for something else than tech demo it’s useless for the time being. Hopefully, all GLES 3 GPUs will support VTF. And with usable performance – VTF was uselessly slow on desktops in the beginning. Follow some of the implementation details in part 2 (soon! ).